A photo of the former Virgil Lewis home in Mason. Over my winter break, I had planned on attending as many local council meetings as possible on this same topic that I’m about to lay out for you all. I find council meetings particularly interesting and very welcoming, despite how familiar I’ve become to some of our council members. (That’s a joke, folks!) Between getting my wisdom teeth cut out and other scheduling conflicts, I only made it to the County Commission and the New Haven Council. Still, rather than wait until I’m home again for summer break, I’d like to reach out both to the other councils and you, the public, with an idea that I believe has real merit in a county like ours. I’ve wrote before that our county’s history is in a sorry state, but I don’t think I was blunt enough. I wrote about the Virgil Lewis House in Mason, the Industrial School for Colored Boys in Lakin, the High School and Ben Franklin Store in Point Pleasant, and the Steenbergen Plantation in Gallipolis Ferry. I think that was the problem. These buildings were all enormously important buildings, and they were well-known to the communities that felt their loss. But in focusing on those important buildings, we lost sense of the big picture. One way to look at the number of historic buildings in a county is to look at the National Register of Historic Places. Of course, only truly exceptional buildings are added to the Register, and even some of those are left out because of funding, paperwork, politics, and so many other reasons. With all of those hoops, our list could be worse. Mason County has had 103 buildings and sites listed on the Register, 92 in the Point Pleasant Historic District and 11 others throughout the county. 103 buildings! That’s a decent number. Now, I went through the Register listings specifically for this article, tallied everything up and made myself a list. Of those 103 buildings, I want you to try and guess how many have since burned down, been demolished, or otherwise been destroyed. (Keep in mind that this is since 1985, when most of our buildings were added to the Register.) After all, most counties lose a few here and there. That’s perfectly normal, life happens. My first guess was somewhere around 10. Wrong. Of the 103 buildings originally listed, we’ve lost 22. Twenty-two… 21 percent… 1 in every 5 buildings destroyed… In only 30 years. That’s an absolutely insane number! Imagine this. These buildings are the physical history of Mason County, in the same way that your photo albums are the physical history of your family. Some of you will understand this in a way that few can, and for that I am truly sorry, but imagine 1/5th of your family photos suddenly destroyed. They’re irreplaceable, and nothing you can do will get them back. Of those 22 buildings, only two were outside of Point Pleasant. One of the Gold Houses in Mason burned, and the Virgil Lewis House was demolished. The other 20 buildings, like the Ben Franklin Store, were a part of Point Pleasant’s historic district. 1/5th of the entire district, gone. Districts have been de-listed for a lot less, and with de-listing goes the historic rehabilitation investment tax credits and every single dollar of state and federal preservation funding. And as much as I hate to say it, because they’re a branch of the National Trust for Historic Preservation, with de-listing would likely go Main Street Point Pleasant, an organization that has done more than Point Pleasant than I have room to write. Think this story doesn’t get worse? Think again. You might’ve noticed that out of the 5 buildings I mentioned at the beginning, only 2 were on the National Register. By my best estimate, there’s probably 500 historic buildings and sites (Indian mounds, ruins, etc.) in this county. We’re losing them just as fast as the others, if not faster because without that Register listing, nobody even thinks about them being historic. The lack of that listing does NOT mean they aren’t historic. Remember, the Register only takes a few of the absolute most important. For the sake of simplicity, using the same percentage as the lost National Register listings (21 percent), if there are still roughly 500 historic buildings, that means there were 633 in 1985. 133 historic buildings lost in one generation… From the stories I’ve heard, that math sounds about right. Something needs to change. I do have two proposals, and I’ll talk more about those next week. But in the meantime, think about those numbers. If we’re losing over 100 buildings every generation, my generation’s great-grandchildren won’t have a history left. Information from the National Register of Historic Places and my own independent research. 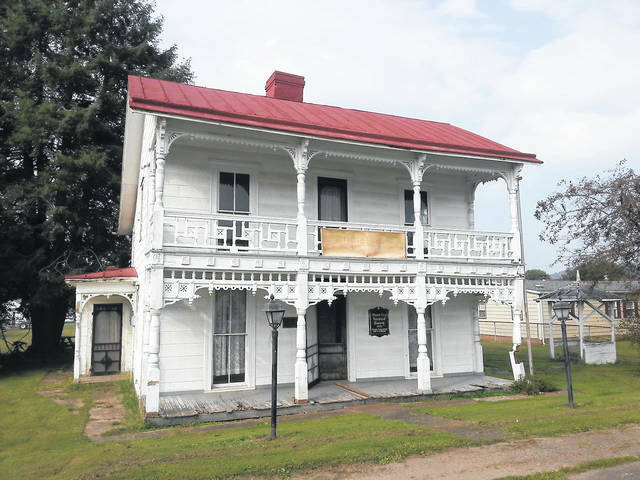 https://www.mydailyregister.com/wp-content/uploads/sites/24/2019/02/web1_unfitlewishouseiswhite.jpegA photo of the former Virgil Lewis home in Mason.